Classic Safari� Range Bag. 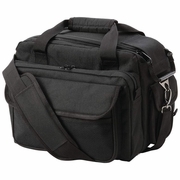 Carry your tactical weapon, ammunition and accessories easily in this organizational range bag. Features padded design; multiple interior and exterior pockets; dual top zippered closure with lock capability; and padded shoulder and carrying straps. Durable 600d material. Measures 14-1/2" x 10" x 12".